During the twentieth century, a number of places in Romania had their names changed for various reasons. For instance, Braşov was called Oraşul Stalin by the Communist regime in order to pay homage to the Soviet leader. Some of those names were changed back to the original; Brașov regained its old name as Romania's leadership began to develop policies more independent of the Soviet Union. The reason for many Transylvanian name changes was to give a more "Romanian-sounding" name to certain settlements, since in many case the original Romanian name was too close to the Hungarian or German one, from which it was derived from (usually a simple re-writing of the name according to Romanian phonetics). This list enumerates the changes made from 1921 onwards. 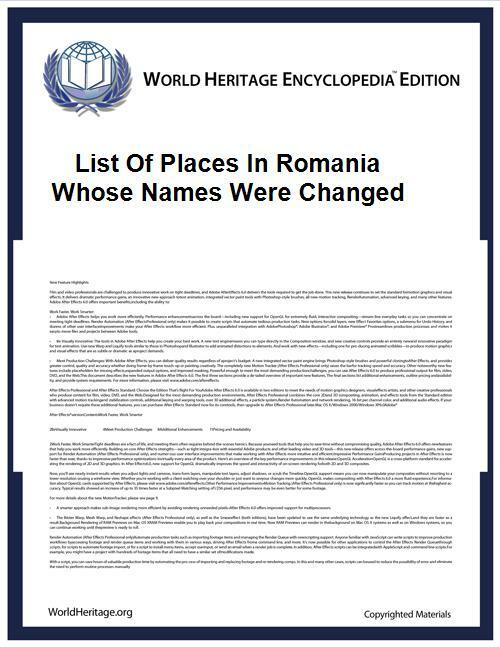 Not included are the names of localities in the Banat, in Transylvania, and in Bukovina that were changed from Hungarian and/or German to Romanian immediately after World War I, the names of localities in Northern Transylvania that were changed back to Hungarian from 1940 to 1944, and those of localities in Greater Romania that today no longer form part of Romania, such as Southern Dobrudja and the Bugeac. Tatlâgeac Mare, Domnița Elena 23 August, Constanţa County ?